The Yama Files Part I: Sue the State and Sue Big! Has Papua New Guinea got the stomach for five days of Peter Yama? Hold on to your hats! Over five excoriating days PNGi publishes the results of an investigation into one of Papua New Guinea’s most controversial politicians; one who has a well earned reputation as a “serial litigator“. But is this a case of a man achieving justice, or abusing the legal system in order to perpetrate injustice? The 2017 national elections marked the return to parliament of Peter Yama, one of the most controversial and colourful figures in PNG politics. A businessman for more than 30 years, Mr Yama has served in Parliament on three separate occasions, been a government Minister twice, been imprisoned for threatening to shoot police officers (a conviction that was later overturned), seen lawyers acting against him issued with death threats, been disbarred by a leadership tribunal (again overturned on appeal), seen his wife charged for currency offences in Australia, and has received millions of kina in damages in numerous civil litigation cases against the State. In September 2017, as the newly elected Governor of Madang, Peter Yama was quick to try and portray himself as a staunch anti-corruption fighter, using the floor of parliament to decry the lack of prosecutorial action in response to the recommendations from numerous Commissions of Inquiry. This was a rather bold move! Yama himself featured prominently in the findings of the infamous Commission of Inquiry into the Department of Finance, which exposed the siphoning of hundreds of millions of kina from the public purse. The Commissioners recommended that Yama be referred to police for what they argue was an unlawful K38 million claim against the state. The Commission also uncovered his involvement in another questionable claim brought against the Health Department. Indeed, since the 1990’s Yama has acquired a reputation as a ‘serial litigator’. He has systematically sued state entities for millions of kina over alleged breaches of contracts suffered by his companies, and sometimes obtaining highly controversial ‘deeds of settlements’ out of court. The old PNG Banking Corporation. This history of high price litigation has culminated in Yama’s pièce de résistance. He is suing the Bank of South Pacific (BSP) for K2.7 billion kina, an action commenced in 2015. In this 5-part PNGi investigation we will explore some of Peter Yama’s most colourful legal cases, and the irregular contracts they were premised on. We will also survey unusual administrative decisions and questionable court rulings – later overturned – that have led to awards valued in the tens of millions. To start, the Leadership Tribunal Mr Yama faced in 2004 will be explored, which signalled a future career based in financial controversy. H. Joku, ‘Threats on law firm slammed,’ PNG Post Courier, 25 January 2010; Abbot, ‘Gaden’s PNG under 24-hour guard,’ Lawyers Weekly, 29 January 2010. 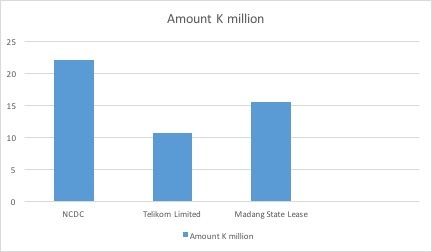 M. Sheenan, C. Davani, D. Manoa, Commission of Inquiry generally into the Department of Finance, 1999, pp 611-612 refers to a settlement of K2.4 million paid to Peter Yama in relation to a security contract at Laloki hospital around 1995. There is also a newspaper reference to a successful court action in 1997, ‘Peter Yama, a minister who lost his seat at the June election, had won a windfall K1 million from the new Government to compensate him for lost security contracts’ in ‘The affair: From power to payback’, R.Callick, Australian Financial Review, 1 December 1997. Yama’s entry into politics as MP for Sumkar between 1992 and 1997, led to his first high profile brush with the law. In 1996 Yama was accused of misconduct in office for failing to acquit public funds and abusing his position as Minister. A year later his case was referred to the public prosecutor. Because he lost Parliamentary seat at the 1997 elections, Mr Yama avoided a Leadership Tribunal until 2002 when he was re-elected MP for Usino-Bundi. In November 2004, the Tribunal found Yama guilty on three counts of misconduct on office. The misconduct charges related back to 1995. As Minister for Works and Transport Yama was responsible for a K21.8 million fund. It was supposed to be distributed equally amongst 109 MPs to implement projects under the Rural Transport Development Program (RTDP). Through the initiative each electorate would receive K200,000. Instead, the Tribunal found that Yama opted to grant K1,557,640, more than seven times its share, to his own electorate. As a result six other electorates missed out on funding for road construction and maintenance that year. As well as over-allocating funds to his own electorate, Yama failed to acquit the money spent. In the auditing world it is essential that when funds are allocated for a certain project, account is made of how that money was spent through relevant documentation such as tenders, invoices, receipts, and bank transfers. Failure to provide this documentation is commonly viewed as a fertile environment for corrupt transactions. The Tribunal also found Yama had failed to acquit K195,000 granted to his electorate under the same RTDP in 1993, and K20,000 granted from a Law and Order Fund. When it came to the appropriate penalty, the Tribunal had two options available under the law. Either dismiss Mr Yama from his elected position, or fine him the sum of K1,000 per offence. I suspect that the leader, in his fairly early days in Parliament, was too enthusiastic about helping his own electorate and to some extent was doing too much for his people in that some other electorates may have missed out. Hinchcliffe J recommended a fine of K3,000. This view was not shared by the other Tribunal members, Magistrates Manue and Monouluk. While it is your right to remain silent on these matters may I remind you that these people also have their rights. One of these rights is the right to information. I say this because the position you hold as a leader belongs to them. The powers you exercise as a leader also belongs to them and the monies that are now unaccounted for belongs to them. Therefore, it is only right that you be answerable to them through this Tribunal. By majority, the Tribunal recommended that Yama be dismissed from office. After losing his parliamentary seat at the 1997 elections, Peter Yama concentrated on business. His company Yama Security Services was the recipient of several lucrative state contracts, some of which were allegedly obtained in questionable circumstances. During this period a trend emerged. Yama made a specialty out of suing governmental bodies for alleged breaches of contract. Yama would demand the whole contract be paid out, in addition to claiming damages and interest. 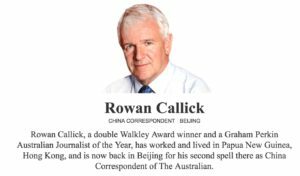 In 2010, the renowned journalist Rowan Callick published in The Australian newspaper an unflattering portrait of Peter Yama and the methods he had allegedly adopted to unjustly enrich himself. Image: Callick’s biography on The Australian website. Callick described Yama as the ‘policeman turned security godfather turned politician’ who appeared ‘untouchable, capable of pulling strings in every quarter’. Yama, thrives in the face of every legal obstacle, thanks to a brilliant formula for business success. He somehow persuades acquaintances, as they acquire senior roles in government agencies, to sign with his company, Yama Security, unusually lavish 10-year contracts that contain a clause requiring the whole contract to be paid out in the event of any breach. Sometimes the managements or boards insist, once they discover their dilemma, that they never approved the contracts in the first place. More often, the contract is dumped over claims that Yama Security has failed to meet its obligations. Then the state, through the Solicitor-General, agrees to a judgment by consent, and finance bureaucrats well inclined towards him ensure the payments are forthcoming. For others claiming from government agencies, this is often a tortuous process. Entities that he has persuaded to engage him on such extraordinary terms include Telikom, Post PNG, the National Capital District Commission government, Air Niugini, the Copra Marketing Board and Motor Vehicle Insurance Ltd. Secure unfair contracts with government agencies in contravention of due process, which invariably end up in breach and litigation. Attempt to secure a settlement improperly through out-of-course settlements that do not conform to PFMA requirements, or through improper default judgements. Securing awards in National Court judgements, which on appeal to the Supreme Court have been slammed for flagrant errors. His case against the National Capital District Commission in particular provides an illuminating window into Mr Yama’s alleged modus operandi … stay tuned for Part II of the Yama files! Additionally, Callick alleges that after Yama was made Minister for Works in 1994, it ‘stimulated Yama’s interest in construction. He established his own building company, which at one stage was awarded 90 percent of road maintenance contracts in Madang province. The company obtained the basic materials for a road on Karkar island by digging up the end of the runway there‘. PNGi has not been able to verify this claim.